Quantitative peptide analysis by mass spectrometry (MS) has become indispensable for interrogation of proteins in complex biological samples. This complexity requires multiple approaches, so a thorough understanding of these options helps to select the most appropriate protocol for the given question. The high diagnostic potential of peptides and proteins from cells, tissues, and biological fluids is unquestionable. But have the MS-based strategies matured enough to unlock this potential and to allow the translation from specialized applications into diagnostics and therapeutics? Pancreatic adenocarcinoma, the most lethal type of cancer in the United States, often begins in the duct connecting the pancreas to the duodenum. The silent progression conceals the diagnosis at the early stages. Thus, little is known about early biomarkers of pancreatic cancer. 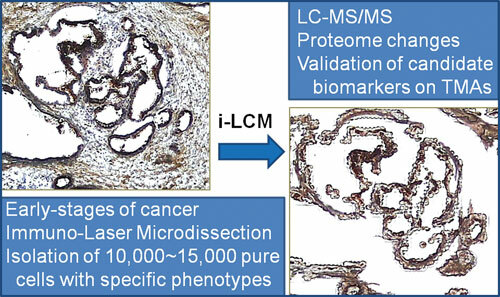 Dr. Lubman’s team used a combination of immunostaining with laser capture microdissection (immuno-LCM). Analysis of immunophenotypically defined cell populations markedly increased specificity of liquid chromatography-tandem mass spectroscopy (LC-MS/MS). Over 375 differentially expressed proteins were analyzed by Ingenuity Pathway Analysis (Ingenuity Systems). Not surprisingly, the major groups of differentially expressed proteins were involved in tumor migration, invasion, and progression. Three selected candidate biomarkers (CD59, CD70, and CD74) mediate the evasion of the immune response. Overexpression detected by MS was further confirmed by tissue staining and microarrays. CD74 specifically correlated with early cancer development and was critically positioned in the NFκB signaling pathway. “The early appearance of CD74 means that this candidate biomarker could be a promising tool in therapeutic drug discovery. Our next step is to search for these biomarkers in serum,” asserts Dr. Lubman. According to Yuri van der Burgt, Ph.D., at the Leiden University Medical Center in the Netherlands, sample workup is an essential part of any proteomics workflow. His team from the Center for Proteomics and Metabolomics, headed by Prof. André Deelder, developed two solid-phase peptide extraction protocols that precede an MS-based analysis. The first is based on magnetic beads functionalized with chromatographic properties, and the second deploys disposable column-like cartridges. Both approaches consistently generate high-quality starting material for identification of peptide signatures in biological fluids. To minimize deviations stemming from preanalytical conditions and to focus on biological variations of the specimen fluids, the team standardized operating procedures for each step of the process. “We spent a lot of effort on optimizing our protocol for high-throughput analysis,” continues Dr. van der Burgt. Using this method, samples from patients with diagnosed pancreatic cancer were compared to the healthy controls. An automated solid-phase extraction protocol utilized weak cation exchange magnetic beads. The protocol allowed for cleanup and enrichment of certain subsets of peptides and improved sensitivity of the MS assay. Out of several hundred peptides reproducibly identified by this profiling, a set of seven was found to be sufficient to differentiate pancreatic cancer from normal samples with a sensitivity of 78% and a specificity of 89%. The validation efforts continue with acquisition of additional samples from other clinical labs. In the future, Dr. van der Burgt sees tremendous diagnostic value for individuals with an increased risk of developing pancreatic cancer, either genetically or due to smoking or diabetes. A similar approach was used to detect breast cancer signatures. To capture a larger percentage of the proteome, researchers used two types of functionalized beads and combined the resulting data. Meanwhile, the research continues to improve the method to make it ready for clinical use. The holy grail of protein profiling is to determine comprehensively the identity, abundance, and isoforms of proteins in a large number of clinical samples, maintains Jun Qu, Ph.D, associate professor at the University of Buffalo, SUNY. “Biomedical discovery necessitates comparison of multiple samples to overcome known problems with individual variability. However, accurate and reliable profiling of multiple samples remains challenging,” he explains. The “precipitation/on-pellet-digestion” method relies on a unique detergent cocktail to achieve a near complete extraction, including that of membrane proteins. Addition of organic solvents, like acetone, denatures and aggregates the pellet, which is notoriously difficult to re-solubilize. The team designed a unique separation column that features low void volume, large loading capacity, and high separation efficiencies. Peptides are separated on a heated, 100-cm-long column during a seven-hour run. The team determined that a label-free MS approach was the most cost-efficient method. It provided excellent accuracy for relative protein quantitation when well controlled. The process was previously applied to several clinically important questions, such as finding underlying causes of hibernating myocardium and chronic obstructive pulmonary disease. The most recent research focused on HIV. Comparison of 10 individuals from each cohort resulted in the identification of 78 differentially expressed proteins. Subsequent annotation by Ingenuity Pathway Analysis software pointed to several signaling pathways that may account for viral control mechanisms in LTNPs. “We were excited to find the SAMHD1 protein in the interferon pathway, which was recently implicated as a critical player in viral restriction,” remarks Dr. Qu, who notes that it would take many years to generate the same amount of data by the traditional methods. Central nervous system neuropeptides are involved in many physiological processes such as circadian rhythms, pain, hunger, feeding, and body-weight regulation. Some neuropeptides undergo functionally important posttranslational modifications. Coupled with their small size (3–50 amino acids) and low concentrations in the CNS, these neuropeptides pose an analysis challenge. Measurements based on MS are well suited for neuropeptide research, simultaneously deducing structural and quantitative information about low-quantity compounds. “We are interested in knowing how the brain works,” says Jonathan Sweedler, Ph.D., professor at the University of Illinois, Urbana-Champaign. Neuropeptides impact many signaling pathways and are highly conserved in the animal kingdom. This allows for discovery and validation to be done on well-defined neuronal networks in the simpler nervous systems of marine invertebrates and other laboratory animals. Dr. Sweedler’s team utilized creative cell-isolation and sample-preparation methods to inventory the neuropeptides. To determine what neuropeptides affect circadian rhythm, they isolated the small region of the brain responsible for controlling this behavior and performed a comprehensive peptidomic analysis to inventory its neuropeptide content. This research found 102 endogenous peptides, including 33 that were previously unidentified, and 12 posttranslational modifications (including amidation, phosphorylation, pyroglutamylation, and acetylation). “Next, we looked at circadian neuropeptides in the functional context, by following peptide release from living neurons,” continues Dr. Sweedler. They prepared thin slices of the areas of the rodent brain containing its “biological clock.” The neuropeptides released from this area were collected and measured as a function of time of day and electrical stimulation. Both known circadian-rhythm-related neuropeptides and peptides with unknown roles in circadian rhythms were identified. The Sweedler laboratory at the University of Illinois at Urbana-Champaign uses a unique approach for collecting neuropeptides from a living brain slice for mass spectrometry characterization. Gary Nelsestuen, Ph.D., professor at the University of Minnesota in Minneapolis, maintains that a growing body of evidence points to the absence of a single new clinical test that has resulted from proteomics studies. “Most ‘bottom-up’ methods are expensive and suffer from inconsistent protein detection. Perhaps, instead of striving to identify as many proteins as possible, we should focus on approaches that analyze just a few proteins but with excellent predictive value,” he says. Dr. Nelsestuen’s work focuses on MALDI-TOF analysis of intact protein isoforms. While seemingly low-tech, this approach allows the screening of a large number of samples in a reproducible and cost-efficient manner. Profiling of a 5,000 blood/urine sample set representing a wide variety of disease states revealed important information about biological variations in normal populations. Change of isoform ratio related to health outcomes is illustrated by the analysis of glyco-isoforms of intact apolipoprotein C3 (ApoC3). A 1.8-fold change in the glyco-isoform ratios correlated with obesity, specifically among subjects eligible for bariatric surgery. Bariatric surgery resulted in the rapid change of isoform distribution to that of non-obese individuals, after which the distribution was stable in each individual. Similarly, glyco-isoform ratios were indicative of chronic hepatitis C, liver cirrhosis, and sepsis. The information provided by glyco-isoform ratio changes may provide important, novel information for diagnostic, prognostic, and therapy response to metabolic conditions. However, it requires monitoring of each patient over time. Remarkably, two ubiquitous isoforms of saposin B, thought to be an activator of lipid degradation, were low or absent in patients with advanced kidney disease, while a number of other components appeared. The team is combining this data with metabolomics profiling to identify early diagnostic biomarkers.